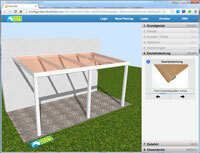 The latest Skanholz-Online-Configurator is available. It enables a view to the future of the o2c-Technology, because it is a Prototype of the new o2c-Technology. o2c 3.0 will not need a plugin or an o2c-Cloud-Server at all and work on platformindependent and in all Browsers. It bases on WebGL and HTML5. Eleco is looking forward to a first Version of the new o2c-Players, that can show the wellknown o2c-Objects without the need of Conersion.